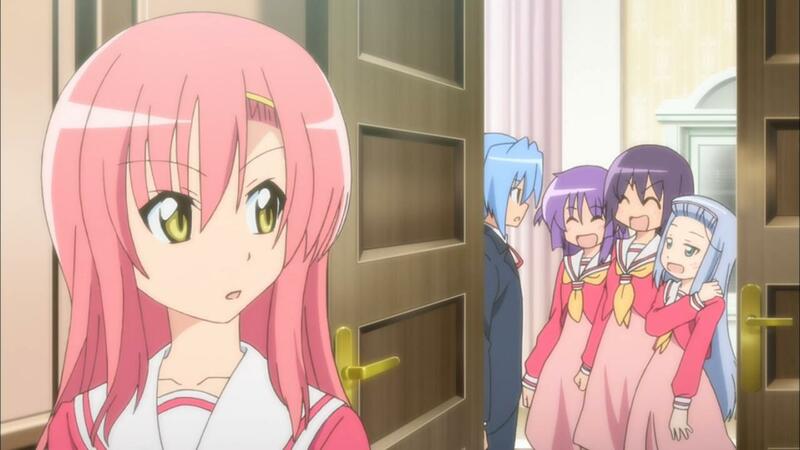 Hina observes Miki brazenly asking for Hayate to give her a massage at school, which he complies with. This causes her to want one. 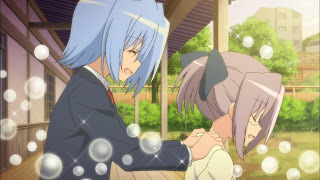 At Yukari-chan House, she notices that Hayate gives a massage to Chiharu and gets a little jealous, but she ends up making her own chances of getting a massage from Hayate worse when she puts Chiharu’s massage to a halt. 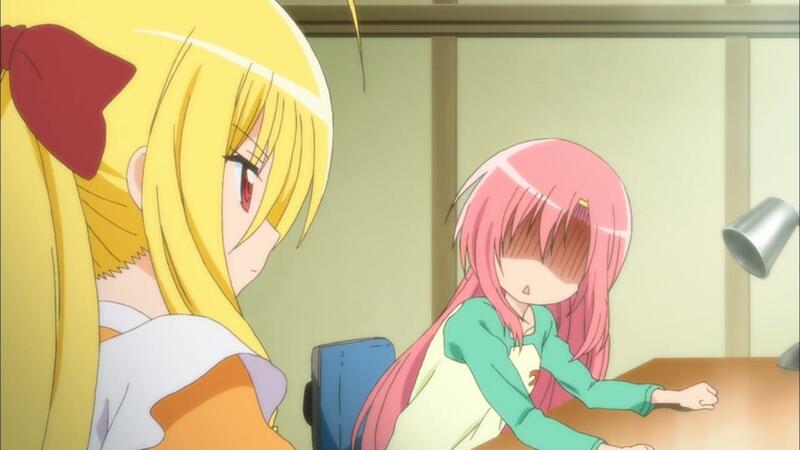 That evening, Hina is helping Hayate study, so she decides to throw visual hints at him. He doesn’t take the hints, so she tries an audible hint. This time, he takes the bait, but again, Hina thwarts herself by her words, so again, she gets no massage. Hina returns to her room depressed, but Ah-tan tells her not to give up. The next day, Hina gets a call from Hayate to come to the mansion, so she does. 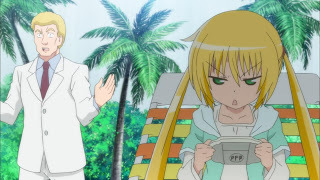 She finds Hayate, Nagi, Maria, Miki, Izumi, and Risa at the indoor beach resort on the Sanzenin property, which Nagi calls Sea Disgaea. 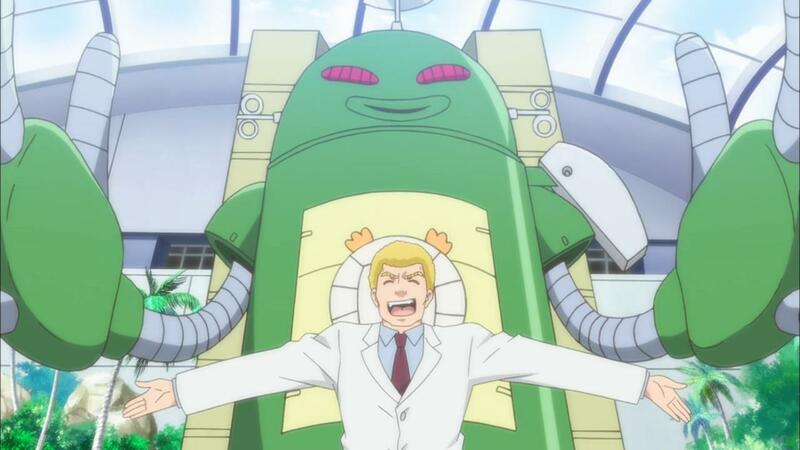 Gilbert shows up and goads Nagi into accepting his challenge, where he is playing beach volleyball with a modified 8 robot. Gilbert wants Hina to be Hayate’s partner since he sees Hina as fragile. 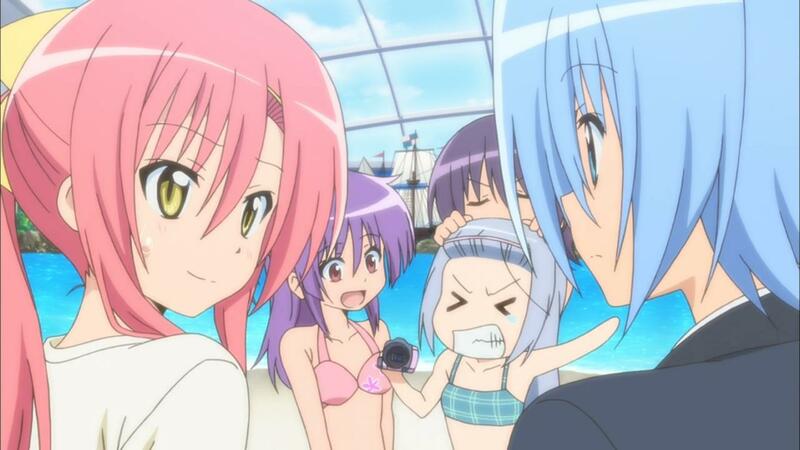 Hayate and the others think they’ve won, but Hina wants Hayate to see her as a girl, not a tough broad. So, when the match starts, she feigns being hurt over getting the ball sent to her. Hayate thinks he’s messed up and apologizes. Gilbert pushes Hina’s buttons with various insults to her, so she decides to get serious with the volleyball game. 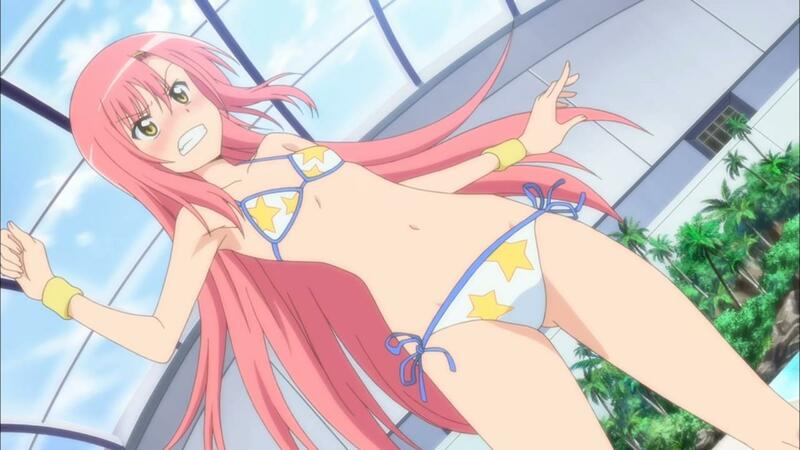 Now that Gilbert is losing, he demands Hina follow the rule that demands girls playing beach volleyball wear a swimsuit. Miki is all for this, and with some prodding from Gilbert, Hina loses her clothing for her swimsuit, after which, she trounces Gilbert’s team. Afterward, Hayate scolds Hina for stripping off they way she did, so she beats him as a result. That night, she’s regretting her ways in the tub. However, as she sits on the engawa, Hayate stops by and she’s finally able to get her shoulder massage. For the record, this travesty was adapted from manga chapter 340 (volume 32), chapter 221, chapter 222, chapter 223, (all from volume 21), and then ending on chapter 340 again. Forgive my poor attitude. I’m really not in the right frame of mind to be writing a review, since I’ve had to deal with stupidity for days and days on end. As such, my tolerance for stupidity is nonexistent. For the first four episodes, it was heavily implied that the events of Cuties take place AFTER CTMYOY, which is stupid. With this episode, Cuties doesn’t specifically confirm it, but it does make the absolutely stupid assertion that for whatever reasons, Nagi decides to slum it out on the weekends at Yukari-chan House (or other times). 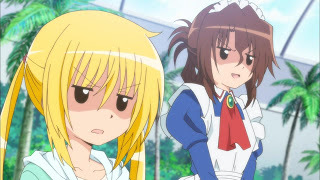 So, she drags Hayate and Maria with her to slum it out with the bozos. Yeah, ’cause that makes lots of sense. Oh wait, it doesn’t. This series has left a bad taste in my mouth, but this episode took the cake. That’s because it took the beach volleyball story from the Golden Week trip in Greece, which actually had purpose, to some BS thing done on whim when Nagi suddenly realized, “Wait! Why am I slumming in this old apartment house when I could be living the high life?” This offended me, but it goes beyond that. The problem with this series is that it demands folks be fairly current with the Japanese manga, through volume 34 at the very least. If you aren’t that up to speed on the manga, you aren’t going to know jack about these characters that have been introduced, nor anything about this doujinshi contest Nagi refers to at times. However, if you ARE current with the manga in Japan, the series becomes an insult because of how it is Frankensteined together. 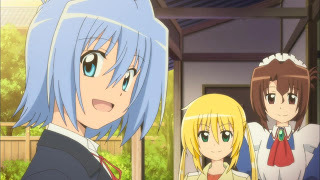 In doing so, stories that had meaning and continued on, such as what happened with Hina and Hayate after the volleyball match, are lost. Indeed, Gilbert’s reason for starting the match was because Hayate kept kicking his arse to save Nagi’s inheritance. This was Gilbert’s attempt to find an easier way to beat Hayate and score the prize. So as I see it, Manglobe should have either come up with their own anime and properly introduced characters, or they should have just done these adaptations as separate stories rather than trying to put them together like Frankenstein. Funny thing. I just re-read this in the Viz release. So yeah… I know I just said I didn’t mind last episode post but now I’m pissed. This is a great example of how a cowardly mangaka paired with stupid marketing decisions can destroy a once-great franchise. Well, the franchise isn’t destroyed. The anime side has taken a massive hit IMO, but the manga is still going strong. Funny thing, I saw the first series first, which lead me to the manga. I found that after reading the manga, I couldn’t rewatch the first series, which is far better than Cuties is. 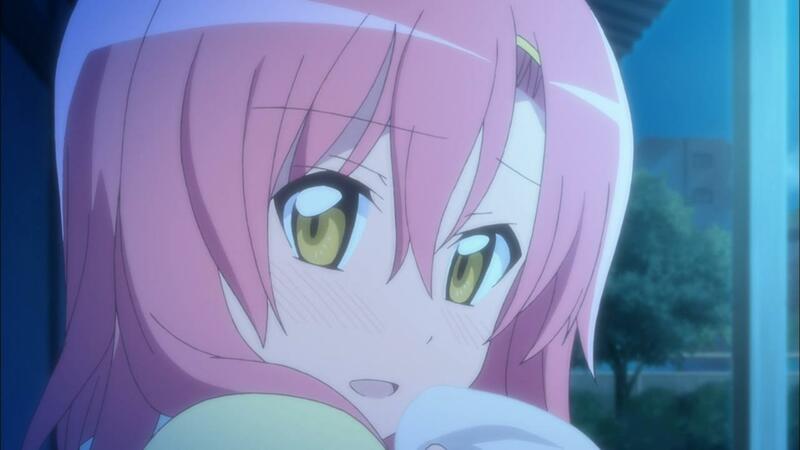 Was Hayate lying when he said that Hinagiku is fragile? They all were. Since Hina wanted to be seen in a more girlish light, she was happy with it. But yeah, no one but Gilbert believed Hina was weak or frail or fragile.